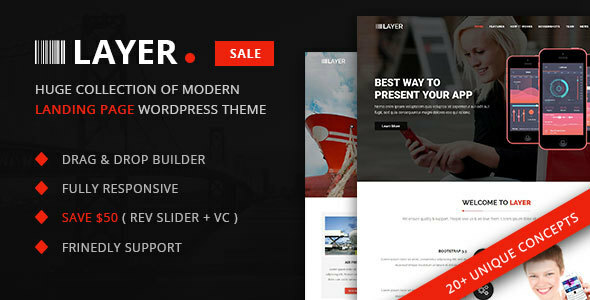 Layer is a Powerful, Responsive, Creative, Clean and Multipurpose Onepage WordPress Theme with latest web design trends. It is perfect for any type of business like Digital agency, Creative people, Photography, Personal resume, Freelancers and Portfolio, Coming-soon etc with Built in templates. It is developer friendly for Very Flexible, Easy for Customizing, Well Documented and commented. Layer comes with our powerful custom drag & drop visual composer page builder. With visual previews in the backend and with features like copy & paste, you will fall in love with this super fast builder. Layer comes with a comprehensive & admin options panel that lets you control every single part of the theme. Create unlimited demos with 500 google fonts, advanced color controls to customize the theme to your liking or simply use any demos that we included already. Layer has a balance between beautiful design and functionality. Each demo has been carefully crafted & with balanced typography and layouts you can easily create a great looking websites. Layer comes with more than 30+ different header layout combinations, 12 menu layouts, 4 body layouts & 6 footer layouts, which you can combine in any manner. It has Variable gutters, multiple columns, Masonry columns, gradient overlays, 8 design options, likeable items and many more options, It literally provides unlimited ways to present your work in any style manner. Also it support audio, video, gallery formats in your portfolio work. you can easily add any thype of portfolio with Layer. Layer comes packaged with this amazing premium slider plugin worth $19. Stunning layered css3 transitions and over a dozen different starter templates, makes this the hottest slider plugin in the market. Layer comes packed with over 90 shortcode modules to help style your website content in a simple ways. They are integrated with the page builder for easy use. Layer comes with sample content data and with one click import option to help you get started easily by setting up your site like any of the demos you like. You can mix and match layouts and pages. Create video background easily in Layer theme. Communicate to your visitors quickly and efficiently using subtle background videos. Layer has innumerous pages which was pre built with in theme which are coming soon, maintenance mode, sitemap, 404 page, faq page and search result page.